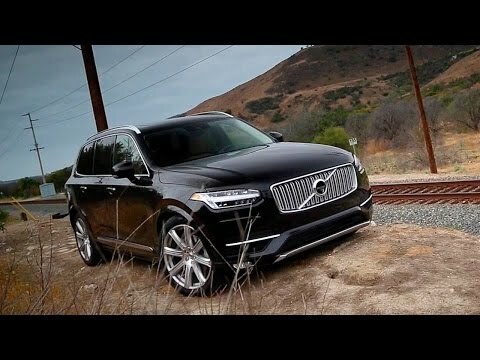 After launching one of the most ambitious design overhauls in modern memory, Volvo's XC90 crossover SUV for 2017 utterly validates the Swedish automaker's efforts. The 7-passenger XC90 breaks new ground on a number of fronts, the most obvious under the hood where 4-cylinder turbocharged and supercharged Drive-E gasoline engines replace what would normally be a V6 or V8. My Volvo has wonderful safety features such as, Parking alerts, front/side and rear cameras, lane assist and much more. I love the semi-auto cruise control. It also came with a built in booster seat in the second row which is great for my son. With its turbo and supercharger, it is fun to drive and has a pretty decent get up and go for being a three row SUV. Hybrid is great; doesn't cost hardly anything to charge; you save on gas mileage. I really like the hybrid part of my xc90h. I also like all the safety features and the fact it raises/lowers itself for easier entry. I do not like the premier leather because it does not hold up to normal wear and tear. Even service departments admit it is giving them a problem. Safety first. Gets very good gas mileage on the highway but is very thirsty on the city. Has one of the best sound systems in a car today. The only issues I have had with car is the tires exhibit small bulges from the excessive potholes. I have had 2 tires replaced. This cat purrs like a kitten. Loaded with safety features. My 7 year old likes the car more than I do. Volvo Car USA LLC (Volvo) is recalling certain 2017 XC90 vehicles. The Micro Gas Generator (MGG), a subcomponent part used within the right hand side seat belt retractor for the third row seats, may detach after the seatbelt retractor pretensioner is deployed. Although, the seat belt will operate as intended in the event of a crash, if the MGG detaches, it may be a projectile within the vehicle cabin, increasing the risk of injury. Volvo will notify owners, and dealers will replace the third row passenger's side seatbelt retractor, free of charge. The recall began August 4, 2017. Owners may contact Volvo customer service at 1-800-458-1552. Volvo's number for this recall is R89716. Volvo Car USA LLC (Volvo) is recalling certain 2017 XC90, S90, and V90 Cross Country vehicles. The bolts that secure the Inflatable Curtain (IC) air bags in place may break, possibly resulting in the IC air bag deploying improperly in the event of a crash. As, such, these vehicles fail to comply with the requirements of Federal Motor Vehicle Safety Standard (FMVSS) number 226, "Ejection Mitigation." Volvo will notify owners, and dealers will inspect and replace the bolts, as necessary, free of charge. The recall is expected to begin April 1, 2017. Owners may contact Volvo customer service at 1-800-458-1552. Volvo's number for this recall is R89714.